The left-hand figure is Mr Ernest Hawkes (an employee of the Central Machinery Co., Rushden), of 148 Queen-street, Kettering, and the brother of Mr Fred Hawkes, of Kings-road, Rushden, founder of the Central Machinery Co.
Mr Ernest Hawkes is now serving in the Indian Cavalry Division with the Expeditionary Force. 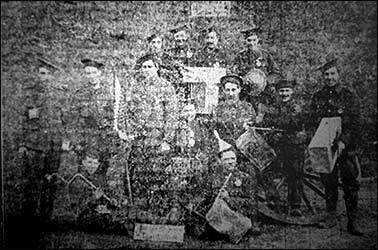 The picture shows a group of Tommies with a wonderful band  composed of bully beef tins and anything else they could get hold of. They are grouped around a disabled gun carriage. Note the dummy Iron Crosses they are wearing.